nipaluna is the name of the country in which the city of Hobart sits. This was the name known by the Aboriginal people of the south east. 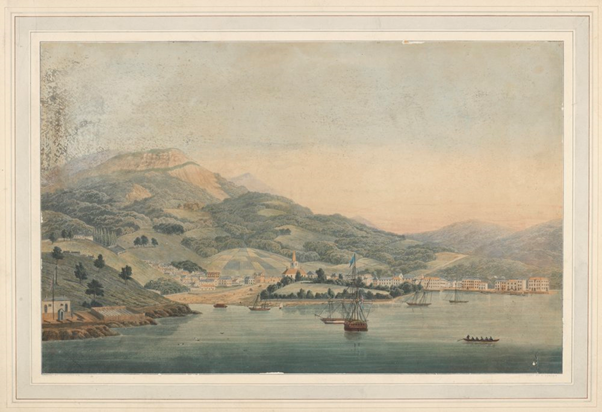 The town came later, in 1804, and it was well established within nipaluna by the time that Wurati first shared the name and its meaning with government agent George Augustus Robinson, as ‘country at Hobart Town’ on 16 January 1831. Most Aborigines had at least two names. Mutteely was also known as Woorraddy (in European spellings), written as Wurati in palawa kani. Wurati was one of eight Aborigines who Robinson had coerced to travel with him as guides on his expedition through the north east and to the Bass Strait islands in 1830-1831; in January 1831 they were returning to Hobart for Robinson to report to the colonial government. On 16 January they were between the Prosser River and Pittwater on the south east coast, and arrived in Hobart Town on the next day, the 17th. Wurati indicates that the Muwinina people who inhabited the area used this name. He himself was a Nununi man from Bruny Island. Both tribes were part of the south east language group. Two of Robinson’s recordings of ‘(1) Nibberloonne’ each have a second word with them: ‘(2) linghe/lineghe’. While no further information or context is given for this other word, it is very similar to several recordings (European spellings) for a word for ‘huts’/’house’/’encampment’, and so may well refer to the buildings erected at the site of the town within nipaluna. Robinson made another recording of ‘Nibberlin’ for ‘the name of the Derwent’ – the river which runs through nipaluna and on which the town sits; and this is also recorded without ‘linghe’. ‘Nibberlin’ appears in Robinson’s Vocabulary for the 1830-1831 period, among many other words which he attributes to ‘B’[runy], although he does not say who told him this word. The nomenclature of Tasmanian Aborigines is not the same as that of the colonisers in that geographical features, like rivers and mountains and so on, are all part of country, and while there may be specific names for those features, they are also a part of the surrounding country. nipaluna includes geographical features such as kunanyi/Mt. Wellington and timtumili minanya (River Derwent). The ‘-loone’ part of nipaluna is seen in other south/south eastern names, including Bruny Island (lunawuni), country at Oyster Bay (puthimiluna) and Prosser Plains (luthmara tipaluna). Another name for ‘Hobart Town’ appears on an ‘Alphabetical List of Native Words – Oyster Bay Tribe’ by ‘HWM 1824’. A conversation with a group of Aborigines is described at the end of the list and it shows the words were collected on country; it is the earliest record of Oyster Bay language. ‘HWM’ cannot be identified. The list was found among Rev. W. Bedford’s papers and published by JW Beattie in 1913. However, as this is an Oyster Bay (east coast) name for the Hobart Town area, it is not a name from the local south eastern language. It is always preferable to revive a word for a place from the language of the place if there is one recorded – as is the case with nipaluna. Note on spellings: ‘nibberloone’, ’Mou.er.neen.ner ’and ‘Woorraddy’ is how Robinson spelt these words, in his (English) spelling system. The Aboriginal spellings, which better represent the original sounds, are nipaluna, Muwinina and Wurati. 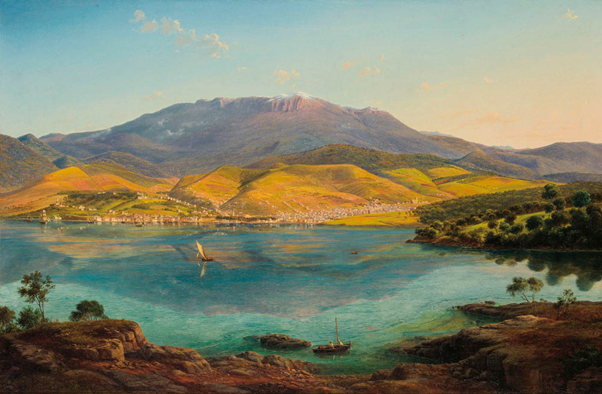 View of Hobart Town, with Mount Wellington in the Background by Eugene Von Guérard 1856.